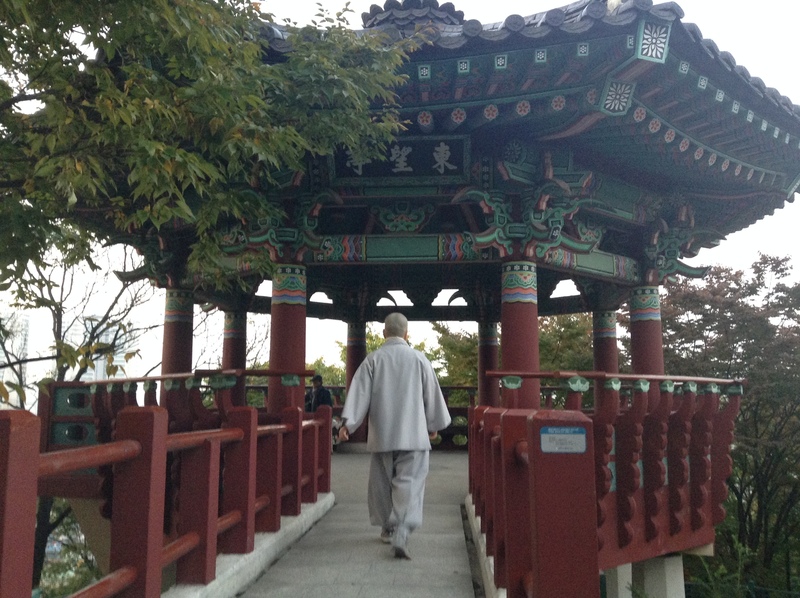 I wrote a post for my Reach the World classroom this past weekend about my experience at a temple in Seoul (Reach the World is a program that I joined via the Gilman Scholarship which is supporting my studies abroad; it is designed to connect world travelers and exchange students from the United States with K-12th classrooms). While I am constrained by space and writing level for those pieces – because I am assigned 2nd graders – I really wanted to expand on my experience on my seouldream blog. 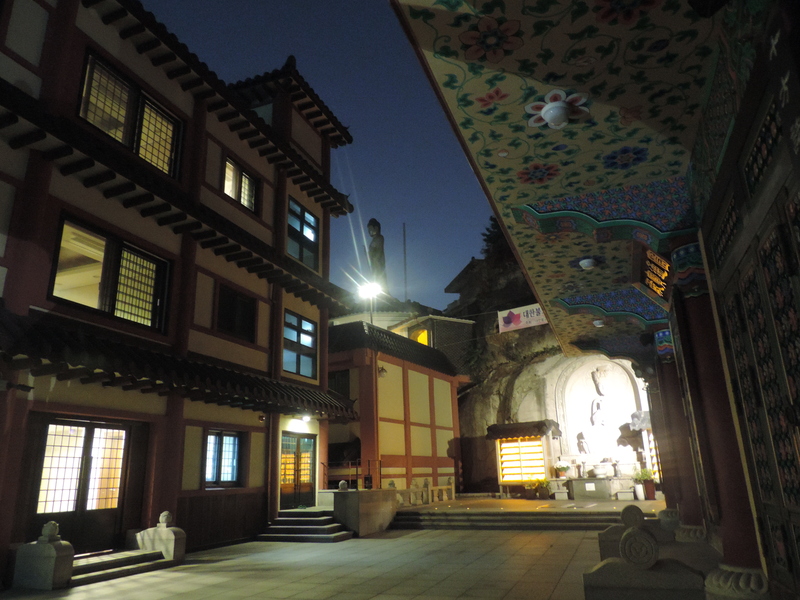 The temple stay indubitably ranks as one of my top three experiences in Korea thus far. I cannot think of a better way to have spent my weekend than to have lived in a Buddhist temple for two days and one night, and I hope that after reading this, you’ll want to experience it too. I spent three days of my Chuseok (a huge Korean holiday where everyone returns to their hometowns and families gather together) vacation in Busan with a couple friends, and on our second day there, we visited a famous temple that looks out over the ocean. It was a sweaty, packed bus ride there and back, but it was worth it. 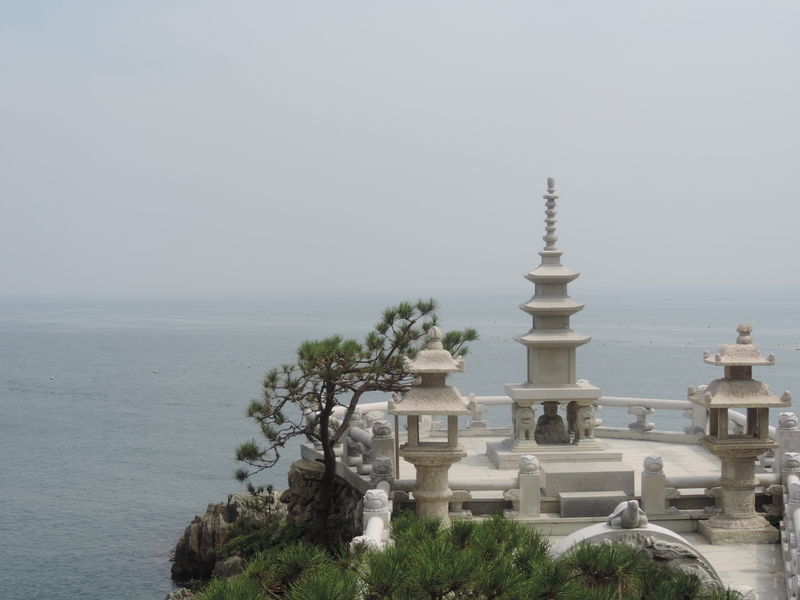 The temple, Haedong Yonggung-sa (해동 용궁사), was perched above the ocean waves, with stairs winding their way up and down the mountainside, and the intricate carvings, paintings, and statues were absolutely mesmerizing. Around that time, I decided that I wanted to find a program to tour a temple more in depth – the temple we visited was simply open to visitors, and there were lots of visitors. There were no monks visible, although numerous merchants were touting their wares along the path to the temple. There’s something about ancient places on the edge of an ocean. Soon afterwards, my Intercultural Communication professor announced a project where we each had to experience something from another culture, write a paper on it, and present it to the class. With my hopes for a temple visit in mind, I approached my professor and she approved my temple stay idea. I also realized that my assigned RTW (Reach the World) article for the week was an interview of a local. How perfect! I was determined to interview someone at the temple, in Korean no less. There was no question as to whether I should go alone or ask if others would come with me: I knew I wanted to go alone. It was less that I felt like I was challenging myself and more than I wanted to experience something without distractions from familiar perspectives (to any friends of mine reading this, sorry, but I’m glad I went alone!). I wanted to meet strangers and “lay down my mind” as my chosen temple stay program was called. And I got exactly what I was looking for and more. I found my temple stay program through a site called Templestay. You can look up countless different programs and even filter results to find something that best suits your needs. As for me, I needed something close to Seoul or within Seoul because I had to do temple stay on the weekend between midterms. Next time, I definitely want to travel outside of Seoul to get a rural experience, although I highly recommend Myogaksa and would definitely go there again. I also recommend the two day, one night program. While even just a few hours is a rewarding experience, if you stay overnight, the things you get to do truly stick with you and refresh your body and soul. Plus, Myogaksa gave a student discount! Dongmyo Station (동묘 앞 역 Line 1 & 6) Exit 2 for Myogaksa. 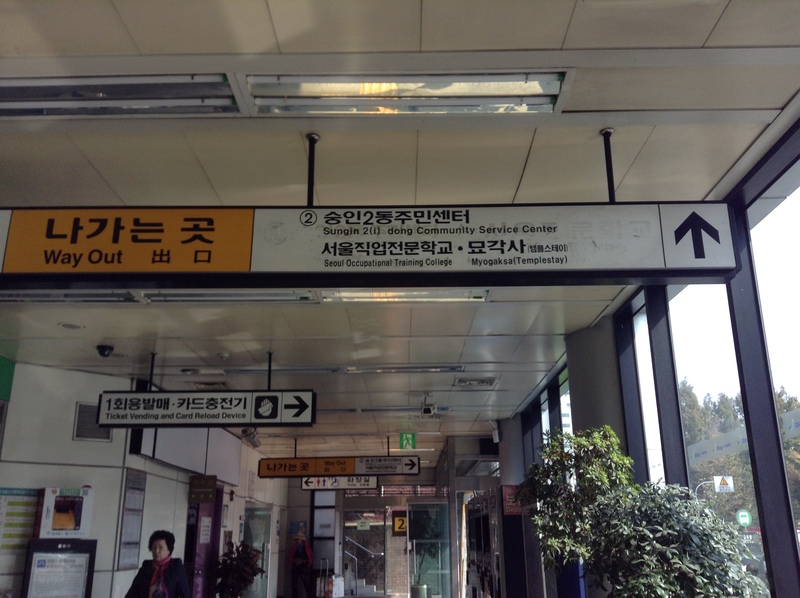 I took the bus and then transferred to the subway to get to Myogaksa from Yonsei University. It only took perhaps 40 minutes, and as I had overestimated the time, I had more than an hour to wander around before the temple stay began at 2pm. I explored the surrounding area, had a nice chat with a local about hangeul and Korean history while looking at a mural, and discovered an amazing little cafe that is wondrously generous with its serving size! Living the 녹차 life. 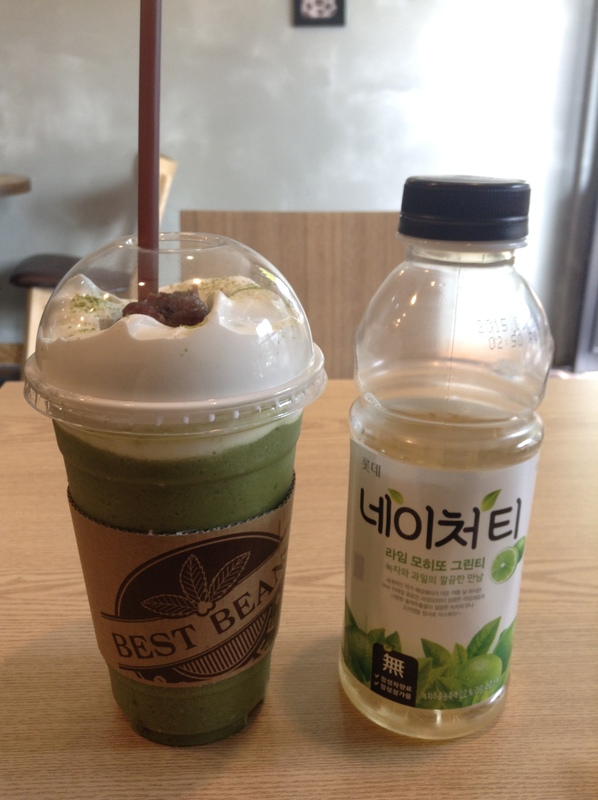 Red bean green tea frappe on the left is from the Best Bean Cafe near Myogaksa. After exiting the subway, don’t turn onto the street where Myogaksa is but keep walking straight for another minute or two – the cafe will be on your left. As I was sitting in that cafe, two more foreigners entered and we smiled at each other. When it became clear that we were all going to the same place, we decided to walk together and that was how I made two new friends. Huzzah for temple stays and little cafes! I don’t want to go into too much detail about the specific program that I experienced because I hope that those who read this will also go to Myogaksa, but I will say a few things. Not all temple stays allow you to take photos, or to truly do everything the way that Korean Buddhist monks do. But Myogaksa has “an open mind,” as Soo-neem (스님 is the Korean title for monk, genderless) said repeatedly. We wore huge, billowing pants and received temple stay shirts to keep. Our shoes were rubber temple shoes, and we made our own rosaries to wear around our necks by threading each of the 108 beads individually, each one after performing a full bow – a prostration. It took a long time and it was good exercise, clearing the mind and making me focus on things that I hadn’t thought deeply about. I considered things that I have done wrong and I thought about how to make amends and change myself for the better. My legs are still feeling those prostrations. During meditation at 5 in the morning, I tried to empty my mind like we had practiced. I tried to figure out how the Zen Master, who so graciously joined us for meditation though he could have stayed in his room to do it, has managed to live this life for over 50 years. 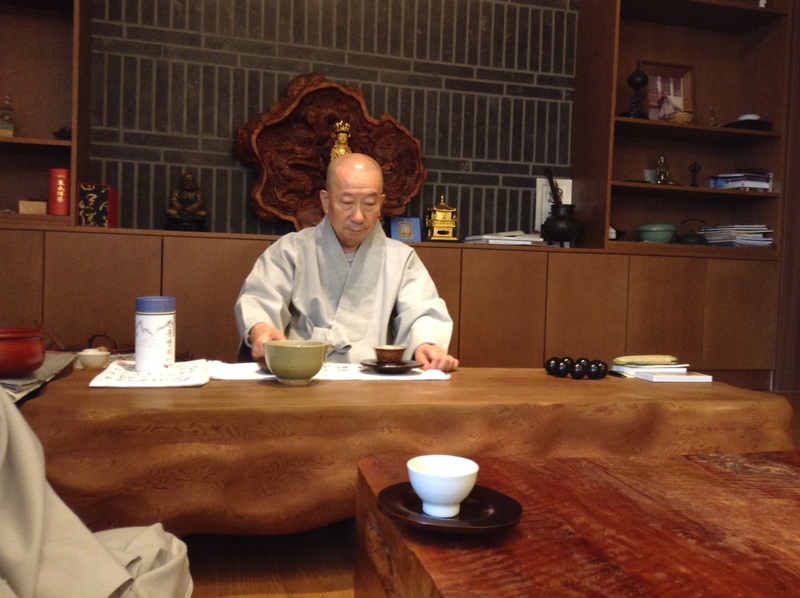 During our second tea ceremony, we actually met the Zen Master face to face and he spoke to us in Korean while Soo-neem translated – he even spoke directly with me a couple times because I was the only foreigner who could speak some Korean! The Zen Master is someone who important, famous people, and regular people alike seek out. When you have big problems that you don’t know how to solve, you go to a temple and perform 3,000 – that’s right, 3,000, not just a measly 108 – prostrations. Then you can meet with the Zen Master and tell him about your problem. He might not even say a single word, but you’ll go away grateful just the same. If he says nothing, that means that you already have the answer within you. Apparently, the current president of South Korea, Park Geun-hye herself, visited the Zen Master that I drank tea with during my temple stay. I even saw a token with her name on it wishing good fortune in the temple….And to think that I didn’t even have to do 3,000 prostrations. He also gave us each a special bracelet to wear, as smaller versions of the necklaces we had made the evening before. I felt like I’d fallen into a movie or a book. The Zen Master and the other monks that we met were incredibly kind and sweet people, as were the various volunteers who help around the temple and with the temple stay participants. I particularly loved our brief walk up Naksan (Nak Mountain) after our early-morning meditation. 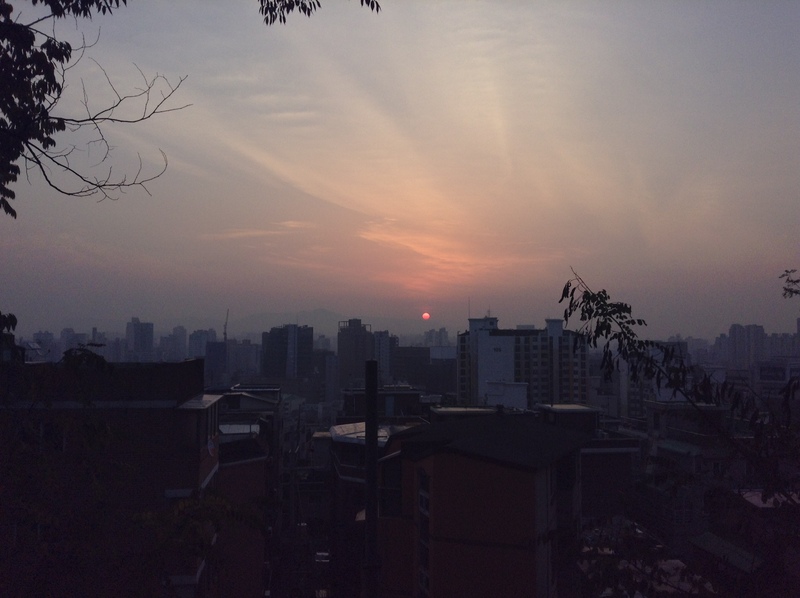 We watched the sun rise over the city of Seoul and listened to Soo-neem talk about the history of the pagoda where we stood and the reconstruction of all the buildings nearby after the Korean War. She even explained that she was a chemical engineer major and had explored many different religions before discovering that Buddhism made the most sense to her. And before I left, she graciously agreed to an interview for my RTW article. The sun rises over Seoul as we make our way back down Naksan. One of the best things about Soo-neem was that, though her English wasn’t impeccable, she did an amazing job of taking care of us and she also was able to get across to us the important things. She said everything with a beautiful smile that filled her eyes, too. I have no doubt that all of us were deeply affected by her words and actions. I have so much gratitude to the monks, the Zen Master, the volunteers, and even the other participants who all were a part of such a good experience. We were a diverse crowd, but I feel that we all left as friends who had an unforgettable experience. Temple stay. Please try. It is very important. Myogaksa’s front courtyard at night. I went to korea this last august and i visited one of the temples in Seoul. I thought it would be cool to do a temple stay, but now i think i might just have to experience it next time i go to korea.